Hit the ground running with a Nokia smartphone translator that's fast and accurate. 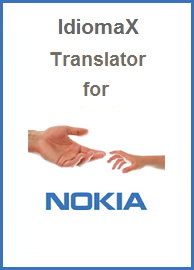 If you spend a lot of time on the move, the Nokia Translator is going to become your faithful sidekick. It converts your Nokia (N8, C6, C7, E7, N97, N97 mini, N96, N95, N95 8GB, 5800 XPressMusic, etc.) Smartphone into a translation device; a multilingual dictionary and verb conjugator come along for the ride. Internet connection is NOT required. IdiomaX Mobile Translator for Nokia Smartphones converts your Nokia Smartphone into a translation device that goes everywhere you do. Translate text, consult dictionaries, and conjugate verbs in five different languages without missing a beat in your busy schedule. IdiomaX Nokia Translator is compatible with most Nokia's smartphones running the Symbian S60 or Symbian^3 operating system. It takes years to master just one language. The biggest challenge for most language learners is verb conjugation. Our Nokia translation App does the work for you in record time, providing conjugation and translation in an instant. You get English, French, Spanish, Italian and German... all in the palm of your hand. Stuck for a word or phrase in a foreign language? IdiomaX Mobile Translator for Nokia Smartphones gives you on-the-spot help. The Nokia translator lets you read websites and other documents in another language, no matter where you are... in the car, bus, train or plane. Between classes or meetings. Between home and work. Anywhere, anytime. View the Nokia smartphone compability list *Nokia is a registered TradeMark of Nokia Corporation.